WOW, great guest lineups this go round. I will have to give this a listen as soon as I can. Listened over the weekend. Congrats on another good show with top content. The Vintage Rebellion return with a slightly delayed show, but another epic show nonetheless. This months main interview is with UK collector and friend of the podcast Simon McOwan. We discuss his Trilogo last 17 run that he's just completed, HC Ford and Sons record erasers amongst many other things, including his failed business enterprise with Dave Tree 16 years ago. In Rebel Briefings, Rich covers a host of topics as he discusses AFA, Selling up, Javier's PBP book, Jawa prices going crazy and he also selects his highlights from Johnpaul Ragusa's Q&A that he participated in on Facebook group 'Jabba's Palace'. Tony Damata joins Grant as they discuss in depth Vintage Star Wars music collecting, whilst Pete brings us a third part of the toy shop interviews as he speaks with Chris Hand from the Leicester Vintage Toy Shop. As Usual Jez delves into the world of collectors newest acquisitions, this month he looks at vintage soap, Yoda hand puppets and miscard's amongst many other stunning items picked up within the community. As well as all this and some other cracking nuggets, Rich decides to give humour a try, if that doesn't make this show a vital download then I don't know what will. The blokes totally quackers!!! As Tony says it's a great focus to take up because of the massive amount of international releases available, plus some great artwork covers. 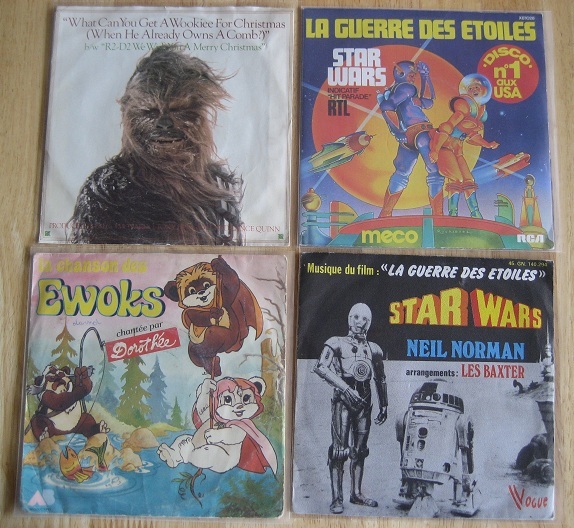 Dorothée, who sang on the Ewok singles, is a famous singer and TV presenter here in France who was hugely popular in the late 70s and 80s for her music and shows aimed at children. She also released a Smurfs single in a similar style to the Ewoks. Meco is a big winner for me. One of the worst songs for me is "What can you get a wookie for Christmas when he already owns a comb?" But this has now possibly been dethroned by the René Joly Star Wars song which I never knew of until this latest podcast. Thanks! The Vintage Rebellion return with a shorter show (but still generally longer than most other podcasts) after such a short period since the last show. Todd Hudson joins the Rebellion to discuss his collecting habits as he delves into his past to discuss his once impressive Chewbacca focus, and more up to date collecting as examine his love of preproduction collectibles including Revenge Proofs, 4 ups, Boxflats amongst many other items. Criz Bee of JediBusiness.com and Galaxy of Toys and ToyRun Podcasts joins Grant for this months oddballs as they look at modern collecting with a Vintage Twist, a real must listen from a true modern expert. Chris Georgoulis joins Richard for Rebel Briefings for an educational and fascinating discussion as he was reunited with a Wax Sculpt head and Tusken body. Marc Walsh also returns to the show to discuss his new shop that he's recently opened in Blackpool. Pete brings us a look at the recent Propstore Auction in this months Market, and be sure to listen on at the end of the show as Rich goes into meltdown!!!!!! Degunk your junk and clear your phone memories, as you're going to need it all for this epic edition of The Vintage Rebellion Podcast. This months show has no less than ten guests joining the team throughout the various sections. Stuart is joined by Horacio Narvaez (Ozio) and Marco Jay to take an in depth look at the Lili Ledy license. Rich has no fewer than FOUR guests during this months rebel Briefings. Jon Spira joins him to discuss the Elstree 1976 DVD release, whilst Adam Pemberton speaks with Jez about the recent Echo Live toy show. Henrik Friden discusses the recent huge Norway haul and Jason Smith returns to the show to discuss Palitoy 45 AB combinations. This month in the newly titled Beyond the Toys section, Grant speaks to Propstore's Prop Guru Brandon Alinger and Emmy Award winning comedy screenwriter David Mandel on their new publication 'The Art of Ralph McQuarrie'. The book which will be the most comprehensive guide to artists behind The Original Trilogy. Pete continues the guest ratio having Chris Botkins join him for Market as they take a look at the Rebel Commando, whilst also delving into the recent Propstore auction. Jez offers a feast of acquisitions in the NA segment, as he looks at Trilogo MTV-7s, Hoth Survival mailer Kits, Canadian Ugnaught MOC, Argentinian Pepsi rulers, TIE Pilot Uzays, AT-ATs and a look at Cash Converters. As well as all this Chris Georgoulias joins the team during feedback to make some corrections on information given during Episode 29. Episode 31 - 21st Century Fox is out now. Enjoy! The Vintage Rebellion return to the usual format after their extended edition last month, in fact this episode doesn't even last 5 hours! Matt Fox joins Stuart and Grant for this months focus interview as he discusses his 'May the Toys Be With You' exhibition and we take an in depth look at poster collecting and the UK poster release. Yehuda Kleinman joins Rich during Rebel Briefings to discuss Yupi, whilst Stuart and Pete welcome Laurence Dyer and Simon McOwan back to chat about the Palitoy Factory Tour that Laurence arranged earlier this month. Clint Garness joins Grant for this months 'Beyond the Toys' section as they look at collecting in Canada. Jez looks at some stunning acquisitions during this months 'Newest Acquisitions' including a Lili Ledy Imperial Commander, Ross Barr's 32 back Han Solo and Micro collection amongst many other beautiful pieces. Pete's Market takes a look at the recent Vectis auction whilst he also welcomes Andrew Norton to discuss the Micro Collection after touching on it during the newest acquisitions. Of course we have the usual banter, drivel and fun in the 31st edition of The Vintage Rebellion. The Vintage Rebellion's first show of 2017 starts off with a podcast that is jammed full of guests. The team remembers Carrie Fisher and discuss when they each got to meet the Princess, and then later in the show select their favourite Princess Leia moments. Stuart, Grant and Rich are joined by collecting illumanti, Ron Salvatore, for this months main interview. Ron discusses a number of topics, from why he collects to Kenner shop displays. His knowledge is testament to the years of work he has put into the hobby. In this months 'Beyond The Toys', Grant is joined by former guests, Mark Daniels and Craig Spivey to discuss a project they have been working on alongside Maped Helix, an exciting time as Helix have agreed to work alongside the three of them and produce a 40th Anniversary line with a nod to the Vintage items. Rebel Briefings sees Rich bring you three interviews as he chats to PBP/Poch : Made in Spain Comprehensive Catalog author Javier Ruilopez, talks Top Toys with Stefan Callaer and chats with Brian Rachfal about his hunt for a certain item. As well as a couple of other items, Jez also reveals information about the 'Running Stormtroopers' newest challenge. Pete is joined by Jared Cope for this months Market section as they look at 2016 prices and trends using the fantastic Star Wars Tracker. And finally Jez brings us a host of goodies in Newest Acquisitions as he looks at a £10 MOC, trainers, 65 back Jawas amongst many other things, and you can all hold Jez accountable for significant price hikes in the Rebel Transport as he clearly articulates why it's the best ship in the toy range!! The Vintage Rebellion return with another 5 hour epic and are joined by the delightful Amy Sjoberg to discuss amongst many other things, her love affair of Ewoks. Keeping on the topic of Ewoks, Pete welcomes Scott Haddow onto Market to look at the MOCwoks as they talk the Ewok MOC Market. This months Beyond The Toys is for every Original Trilogy fanatic. Jamie Benning comes on the show to discuss his filmumentaries project. An original concept that merges film with documentary, a fresh reinvention of immersive 'making of' storytelling. Richard welcomes GW Acrylic UK dealer, Jamie Brown onto this months Rebel Briefings as they discuss the new product line they are offering. Rebel Briefings also brings us an update on baggiegate as well as a feel good story after a collector completed a run in the most unexpected way through the generosity of a stranger. Newest Acquisitions is full of more amazing purchases as Jez walks us through some amazing items, from a Kenner/Palitoy Zuckuss through to a Darth vader Speakerphone. Whilst Jez sells the Tantive XI forum in a passionate manner. All this plus much more, makes this another show you'd be crazy to miss. "Rebel Briefings also brings us an update on baggiegate as well as a feel good story after a collector completed a run in the most unexpected way through the generosity of a stranger." Richard, about how far into the recording is this part (on the off chance you know)? I don't have 5 hours and though I will return to listen to the entire thing this is what I would like to start with today as I finish up work. Also I heard your wheelchair bound????? What happened? Hope your healing well. I've had 'yet another' ankle operation. Shredded ligaments from years of sport. I'm on crutches atm but will not cope in Orlando so decided to get a wheelchair to ease the travel. Are you guys ready for Episode 34 'Brian's Angels'?? The Vintage Rebellion welcome stand out collector Brian Angel to the Podcast to discuss his collecting habits, we discuss Facebook, Engineering Pilots and his R5-D4 focus amongst many other topics. Rich discusses display and shipping ideas with Iain Sanderson and Johnpaul Ragusa. Whilst I host, possibly the most crazy NA ever with a random Tuna Fish advert and a discussion on Yak Face's Muff! We discuss our favourite TIE Fighter from the range and highlight an absolute steal at an estate sale. On Beyond The Toys, Grant welcomes artist Chris Moore where they discuss Star Wars Wallpaper. The Star Wars wallpaper you may have had as a kid, the very same wallpaper designed by Chris Moore! This months market is short and sweet as Pete looks at the 2016 Kenner 12a market prices and the tracker top 5 'Ties' things up nicely. All this plus the other usual gibbering with Stu at the helm from start to finish. If you thought last month's podcast was different, wait until you hear this one! There are a few special one off changes, but we are not going to give away anymore than that. Rich brings us an exciting, nay, game changing update on something which was hypothesised last month. Rich is joined by a plethora of guests with Josh Blake and Bill Wills kicking it all off discussing a little known droids factory mockup. This is closely followed by Stephen Danley talking about his new website, facebook group and podcast as we discuss, Star Wars at the movies. We join Jamie Brown for a quick GW Acrylic update, but wrap up discussing the chances of a new fake in the hobby. Jez hosts yet another ram jammed New Acquisitions section with items ranging from $1 figures and car boot sale finds to extremely rare Hungarian carded Fetts and Uzay ERGs. There is discussion about an amazing line up of Die Cast Landspeeders and the crew have a huge nostalgia #hit with some special vintage items, and the lads take a look at Darth Vaders Star Destroyer. This month Richard is hit with the Rapid Fire questions and is truly called out as a MOC collector. Join us and our 7 guests for what may be the biggest temporary shakeup since George Lucas dropped the revenge title in 1982! The boys return for their 38th episodic show with friend and fellow collector Simon McOwan joining the team for guest hosting duties. Forget the Return of the Jedi, this month sees the Return of the Quiz, with accusations of cheating flying around on all sides! Aussie Lee Harris takes a nostalgic look back at his childhood, whilst also discussing his current collecting stance, as well as depressing everyone with a tale of burning toys! Grant is joined by Jonathan McElwain for the first part discussion on highlights for the US food market for the original Star Wars movie. Jonathan is an expert so expect to learn a lot about a subject rarely discussed. Yum, Yum! In this months NA, Jez and the lads (plus an extra 2 special guests) discuss a variety of purchases including variants, some in the wild 3 pack finds, a lovely story which shows that even Cloud City Clouds can have a silver lining, and the mighty Imperial Shuttle gets the once over. Rich has the pleasure to interview Ross Barr, the face of CAS and brings us 3 stories from the vintage collecting community. So much rammed into just over 5 hours we hope you enjoy the show!!!!!!! Derek Ho joins Stuart for this months main interview as we delve into his collection and growing up with Star Wars in Singapore. We also have a Farthest From special where we hear from Edd Grant, Dan Burgess, Scott Cato, Stephen Savory, Darren Quinn and Jason Smith who all attended the show. And watch out at the end as Episode 40 will see the team return to a permanent five piece and we announce the final member to make up the crew. Dang, I don't have time to listen just now but have been wondering what the conclusion to the baggie stuff was. Seemed the last update I saw was a bunch of confirmed fakes but the guy was still selling and had a booth at an upcoming event or something like that. Looking forward to hearing further on that. Best looking collector in the Southern hemisphere??? Man the show must be desperate to have AJ on there. Kidding, AJ is top notch with his knowledge. I will have to give it a listen when I get a chance.